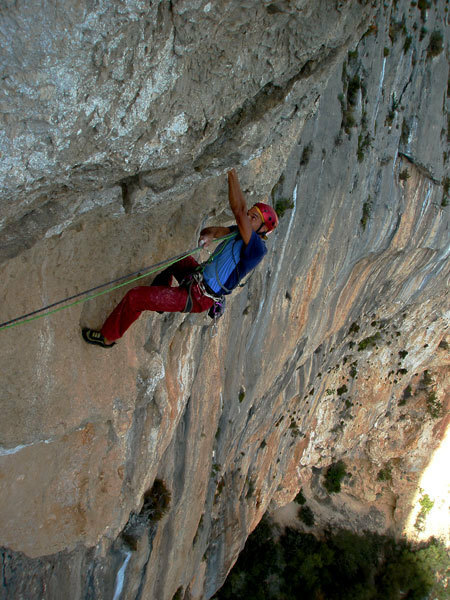 In January 2010 a new route was established on Monte Ginnircu at Baunei, Sardinia. A first pitch was created in 2007 by Fabio Palma and Matteo Della Bordella, and in January Fabio Palma joined forces with Domenico ‘Dodo’ Soldarini to complete the line. In the beginning we called it Murales, but we had to change the name, I’d forgotten that there was a route nearby with the same name climbed by Maurizio Oviglia. The name therefore is Genius and I think the name is perfect, seeing that during the many days spent establishing the route I started off the day writing my book which has the same title. Those who have seen the route were as amazed as us by the incredibly sculpted rock on many pitches, really unique. From a technical point of view it is certainly the most demanding on the entire face. What remains is one pitch still to be freed, this shouldn’t be too difficult, ( THAT SINGLE PITCH WILL BE FREED BY MATTEO DELLA BORDELLA two years later, 8a+/8b) and many memories connected to the start (2007 with Matteo), the continuation (2008 and 2009 with Dodo) and the “guests” (Paolo Spreafico, Luca Matterella and Riky Felderer). I think that my relationship with this rock face, which is the way Mount Ginnircu opens up onto the sea and which I called “Amor de mi vida”, has come to an end. The other possible lines offer difficulties which are inaccessible for me unless I switch to a style of first ascending which I, which we, have always avoided. Dodo and I fought hard against the pitch which remains to be freed, for 5 consecutive days during the first ascent and with the strong doubt that we wouldn’t be able to climb it. It’s obvious that we need to pass the baton to others for harder routes, unless that are unpredictable leaps in our ability. I woke up at six, and I started writing. Dodo got up at 7. I kept writing, I was finishing Genius, the novel, until 11, and I reached the beach. I do not say anything else, I then find a balance on the fifth flight at least, and then the fight to stop, and put the bolt. To continue, it would have been a forced 8th, but I did not have the heart. The length later meets the most sculpted rock I've ever met, a real natural gem. resulting in the discharge of swear words. I suspect that a break start is a bit of a strong heart, I do not know. Gear: a set of camming devices will be found useful. Run-out protection. First ascent: Fabio and Matteo one pitch in 2007, Fabio and Dodo all the other pitches. Note: Grades confirmed by Paolo Spreafico. The second pitch is estimated to be about 8a+.